Precipitation extremes are predicted to increase in magnitude and frequency due to the impact of climate change. This poses a challenge to the urban drainage systems, as they will have to be able to cope with increased stormwater volumes in the future. (Zhou, 2014). 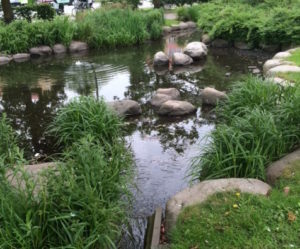 This project focus on the area of Augustenborg in Malmö in southern Sweden, where an open stormwater system has been constructed to improve the areas capacity to handle heavy rainfall events. the simulation. The model is calibrated against ow measurements from the Augustenborg area. The model could be calibrated in 3 out of 4 measurement points. The results show that runoff is accumulating on surfaces intended to be flooded. The model can thus reproduce ow in the drainage network as well as overland flow, and can produce pedagogical inundation maps. The developed model can be used for future studies of the Augustenborg area.